It feels a little ridiculous to be writing a post about tzatziki potato salad today, truth be told. The fact that I photographed such a sunny, seasonal, summery recipe with such a dark and moody feel to it seems particularly apt as I try to wrap my mind around the tragic event at Grenfell Tower. Growing up in west London, I never actually knew the name of Grenfell Tower, even though I looked up at it daily from my customary spot on the tube platform on my way to school each morning. Until the news of the fire broke, one of my favorite memories from those days was the early morning where I heard a mum yelling down from at least halfway up the tower at her son on the platform far below and across the way because he’d forgotten his lunch “AGAIN!!!”. All of us fellow travelers valiantly tried to keep straight faces as this poor lad looked like he wished the platform would open up beneath him and I marveled to myself at how perfectly the wind must have been blowing for that to even work. I think we all secretly wondered in the weeks that followed whether At The End Of Her Tether Mum would gift us with another diatribe, but she never did. Maybe she didn’t realize we could actually hear her, or maybe that kid remembered his lunch from then on out. Knowing that all I’d see if I stood on the platform at Latimer Road now would be the charred husk of a place that housed so many families changes that memory for me. I find myself wondering about whether that lady still lived there, whether she’s among the missing, the hospitalized, the lost, the gone. The grief of so much unnecessary suffering has left me somewhat numb. So, you’ll forgive me if my heart’s not really in food right now. In fact, I’m reminded that being able to write about food and create recipes is a luxury that I never would have even conceived of growing up. When meals could be haphazard and scarce, when nutrition wasn’t something on anyone’s mind despite what they tried to teach us at school, when the most important thing was to cobble together something, anything, as long as it meant eating. When I felt ungrateful for still being hungry after a meal. This week, I’m reminded of my privilege. Reminded of how fortunate I am to be in a position to make choices about my health by way of the kitchen. Reminded of the luxury of the time I can spend in the kitchen, an enormous fridge and the precious ability to shop for food I want rather than just the necessities I need. Reminded that whoever we are, wherever we’re from… respecting our privilege by paying it forward is the least we can do for the world. Mix the two together. Ta da! You can make the tzatziki ahead of time and leave it chilling in the fridge until you’re ready to make the potato salad. Or you can follow the complete tzatziki potato salad recipe and leave the whole thing in the fridge for about three days or so. The only thing to note is that the yogurt will thicken up when it’s chilled, so you may want to take it out of the fridge a little earlier than you want to serve it and give it a good stir just before you do. Although I kept my version here to the classic tzatziki flavors and a smooth tater-centric texture, you can also experiment with adding in some other elements for crunch, like finely chopped radishes, celery or finely diced red onion. Customize it at will! DRAIN: If your coconut yogurt is thin and / or homemade, line a fine sieve with a few layers of cheesecloth, place it over a bowl and let it drain of any excess liquid for an hour or so (or overnight) in the fridge. 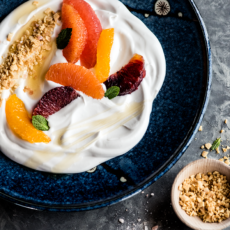 You’ll want to measure out the yogurt you need after it’s drained of any excess liquid, so add an extra 1/2 to 1 cup or so to make sure you will have enough yogurt in the end. BOIL: Peel the white sweet potatoes and chop them into chunks just a little larger than bite size. Add them to a pan of salted water and bring them to a boil, cooking them until just tender but not too soft, about 15 minutes. COOL: Drain the cooked sweet potatoes into a colander and let the steam escape before transferring them to a large bowl. Pop the bowl of cooked sweet potatoes into the fridge until the chunks are cool to the touch, about 30 minutes. SQUEEZE: While the yogurt is draining and / or the sweet potato chunks are cooling, wash the cucumber and discard the ends, but don’t peel it. Cut the cucumber in half lengthwise, then scoop out and discard the seeds. Use a box grater to coarsely grate the cucumber. Wrap the grated cucumber in a double layer of cheesecloth, forming a ball. Twist the ends of the cheesecloth to seal, then gently squeeze out the liquid from the cucumber over a bowl. Reserve the squeezed cucumber water for later. COMBINE: In a large bowl, stir together the yogurt, cucumber, lemon juice or vinegar, garlic, dill and sea salt until evenly combined. Taste and adjust the salt to your preference. If you would like a slightly thinner tzatziki, you can add a little of the reserved cucumber water and stir it through to thin. Add a spoon or so at a time — you won’t need all of the liquid! Add the cooled sweet potato chunks to the bowl and toss gently to coat evenly. Taste and adjust for extra salt, if needed. SERVE: You can serve the tzatziki potato salad immediately, or let it chill further for an hour or so in the fridge if you like. STORE: Keep in the fridge for up to three days. Keep in mind that the yogurt will thicken up when it is chilled, so you may wish to take the tzatziki potato salad out of the fridge a while before serving. Rachael – this looks phenomenal! What a unique twist on your typical potato salad. Love it!